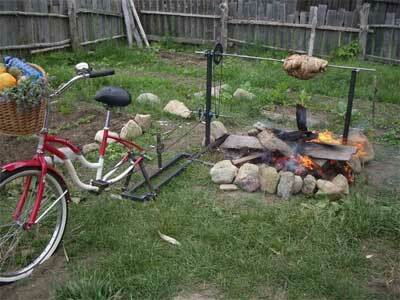 Are you or your family celebrating this Thanksgiving on bike? If so, please send a snapshot or two for our new photo essay of Provo by bike. These can be old or new photos. Please send photos to Jamie at jamielittlefield(at)gmail.com. And, have a wonderful holiday! 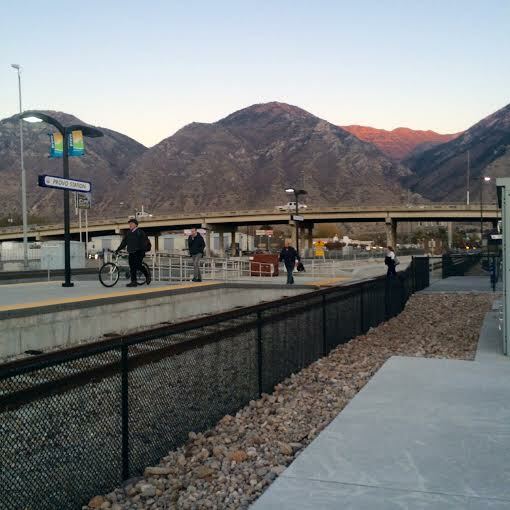 Bicycles and public transportation go hand in hand, and the Provo FrontRunner station now offers a variety of bicycle amenities to help cyclists travel by train and bus. UTA has been doing a fantastic job adding resources to help make riding to and from the Provo station easy. Here’s what you need to know. 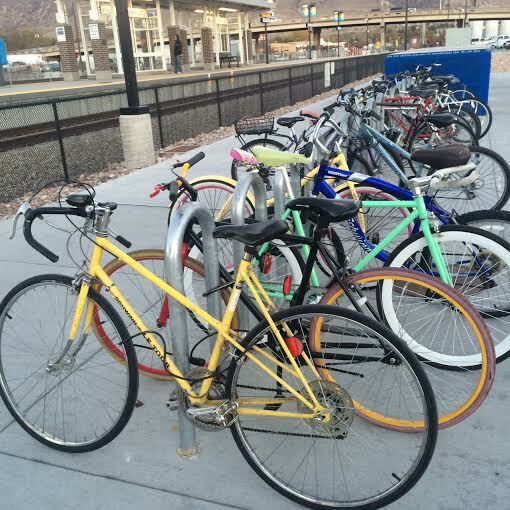 Just south of the platform, the Provo FrontRunner station offers numerous bicycle racks. Anyone is free to leave their bike, although the racks to tend to be a bit crowded. If these racks are full, a few additional racks can be found by heading east along the same sidewalk. Be sure to bring your U-Lock. More secure bike lockers are also available to rent. The box-shaped lockers can be found just east of the bike racks. Each locker is rented to an individual rider for $70 a year (plus an initial $30 deposit) and is accessed by a key. 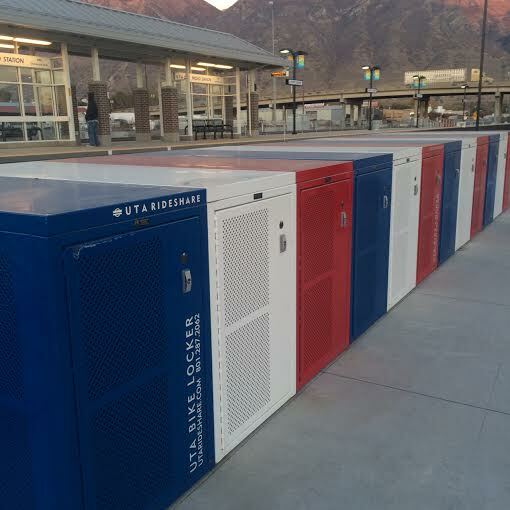 To rent a bike locker, fill out the form on the UTA website. 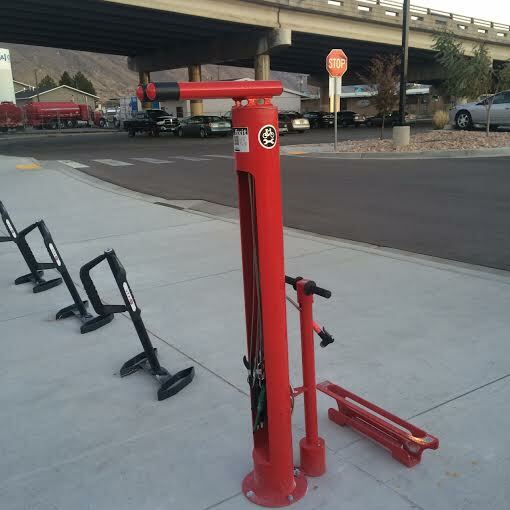 UTA recently installed a DERO bike fix-it station. To find it, walk to the far east side of the sidewalk south of the platform. With this station, anyone can fill a tire, tighten loose parts, or perform basic bicycle maintenance. 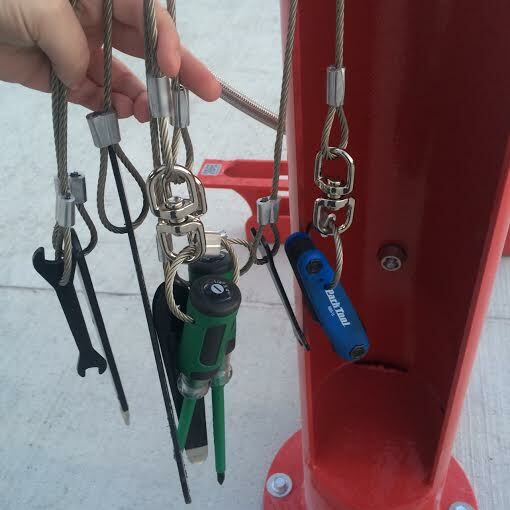 The station includes all of the essential bicycle tools on cables attached to a bike stand. There is also a bicycle pump and wheel holder. 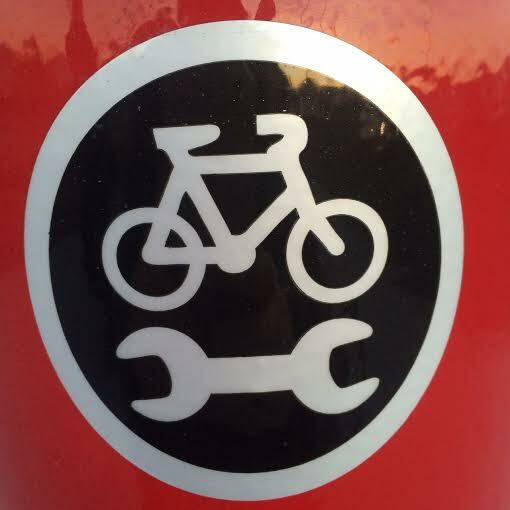 There is no cost to use the Provo bike fix-it station. 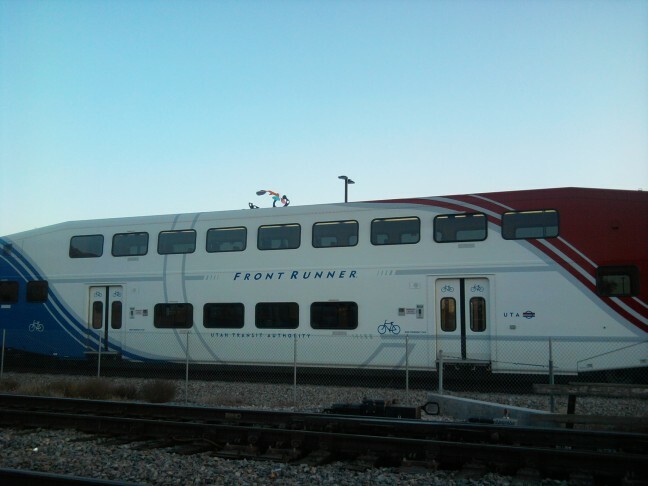 Most FrontRunner trains have a bike coach, designed to hold 12 bicycles and their owners. See all those bike symbols on the coach above? Apparently, that coach has room for 12 bikes. You can just roll yours on in and sit next to it; no need to worry about awkwardly affixing it to some caboose carrier or anything. Board the bi-level car closest to the locomotive. There are spaces for 12 bicycles to be parked upright on this car. If using any other car, enter through the door with a green bicycle symbol. Place the bicycle under the stairs (room for 4 bicycles). If the Bike Coach is full, you can also look for bike spots in other double-decker cabs. Each stores 4 on the bottom level. No bikes are allowed in single-level cars. Your best bet is to line up just behind the bicycle icon on the platform. Happy riding! 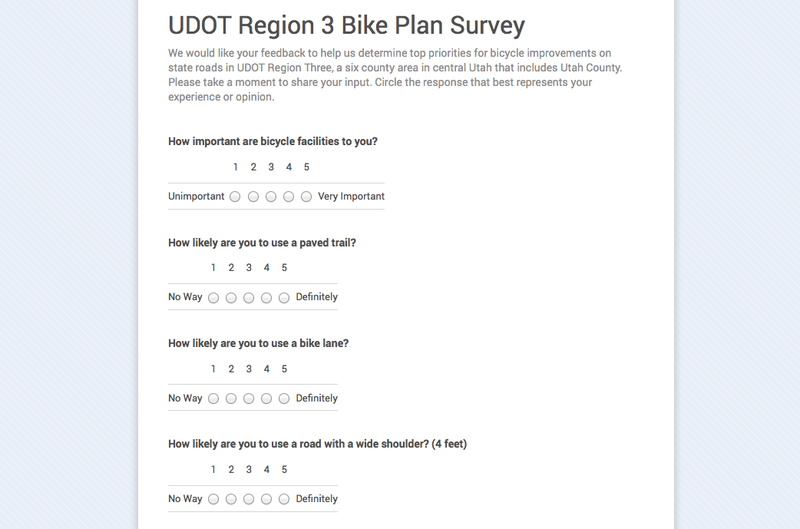 UDOT is taking Provo’s input on how to spend funds available for bicycle infrastructure and facilities in Utah Valley on state-owned roads. Please help them out (and help them see what Provo residents feel is important) by taking this online survey by Friday. Please share this link with your family and friends…and fill it out yourself as soon as possible. Completing the survey is a quick way to make your voice heard and should only take 5-10 minutes. Do you care about Parking in Provo? You should. Join in with other residents and municipal leaders to help create a city-wide parking plan on Thursday, November 13th from 5:30-7:00 p.m. This is your chance to weigh in on an important issue that will directly affect cyclists for years to come. Should parking take precedence over wide sidewalks and bike lanes? Does every stall need to be for a car or should bike parking be included as a part of the plan (as it is in Salt Lake)? How do we weigh the need for parking spaces with the need for other public facilities (green space, bike lanes, public transportation, etc.) Now is the time to let your voice be heard. If you’d like to read up on some of the issues surrounding parking, take a look at these insightful essays: The Cost of Free Parking, Free Parking or Free Markets, Free Parking Comes at a Price, Salt Lake Rolls Out New Bike Corrals, Direct Costs of Urban Travel (image), Downtown Provo Parking Map (interactive map). Provo, Utah – (November 4, 2014) – The Provo community is invited to a presentation and public input forum that will be held at the Provo Municipal Council Chambers on Thursday, November 13 from 5:30 – 7:00 PM. The forum will be conducted by representatives from Kimley-Horn and Associates, a national consulting firm that has been engaged to create a Strategic Parking Management Plan for the City of Provo. The goal of this planning effort is to develop recommendations for a customer-focused and effective parking management program that will complement the City of Provo’s larger strategic and economic development goals. Kimley-Horn has conducted similar planning efforts in cities across the United States and the presentation will include an overview of the project scope, as well as examples of “Best-In-Class” parking management practices from communities similar to Provo. The forum will be led by Dennis Burns, CAPP, Regional Vice President of Kimley-Horn and Associates, a nationally recognized parking expert who speaks on a variety of parking and transportation topics both nationally and internationally. Mr. Burns has been honored as the International Parking Institute’s “Parking Professional of the Year” and was invited by the White House to be a speaker at the first “Green Government Symposium” held on the campus of the George Washington University in Washington, DC. Mr. Burns will be joined by Vanessa Solesbee, President of The Solesbee Group. Ms. Solesbee will present a brief case study of how the community of Cedar Rapids, Iowa successfully implemented a Strategic Parking Management Plan. The forum will serve as the project’s official “kick-off” and is the first of many opportunities for the Provo community to provide feedback on the Strategic Parking Management Plan. The consulting team will be meeting individually with key community stakeholders during throughout November and December, and will hold another public input forum in early December, which will feature top parking and transportation program managers from across the country. There will also be several opportunities to provide feedback online via a new “Vision Provo” virtual town hall website, which will be launched in conjunction with this public meeting. 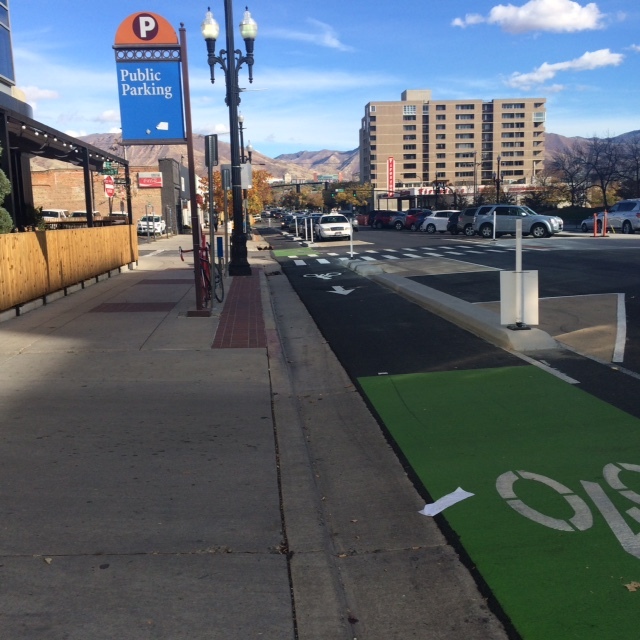 Image: A new buffered bicycle lane in downtown Salt Lake balances sidewalk space, on-street parking, off-street parking, and roadway.